When I was a kid I loved the night, that’s when you could hear all the real sounds of the city, a distant siren, a drunk guy cussing at a lamp pole. Best of all were the sounds coming from the bars and night clubs. In one an older fat guy playing some Ellington tune, another a trio jaming out a slow smokey jazz beat, while the people sat motionless bobbing their heads and digging every note. 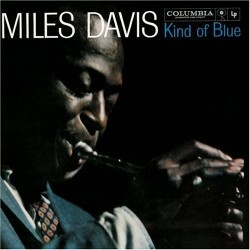 This album reminds me of those days, I’ve listened to a lot of jazz lps but this would have to be in my top five. Consisting of the tracks:”So What”, “Freddie Freeloader”, and “Blue in Green” recorded for side one, and “All Blues”, and “Flamenco Sketches”making up side two. With the likes of pianist Bill Evans (Wynton Kelly on one track), drummer Jimmy Cobb, bassist Paul Chambers, and saxophonists John Coltrane and Cannonball Adderley This is a record generally considered as the definitive jazz album. Ranked number 12 on Rolling Stone magazine’s list of the 500 greatest albums of all time.